In the dock, Melbourne Court. The Outlaw Ned Kelly and his gang are finally captured! 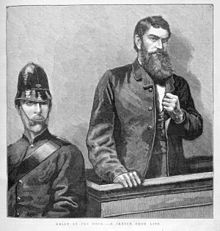 In June 1880, after years of successfully eluding police, the Kelly Gang deliberately staged a final confrontation at Glenrowan in Victoria. Kelly had hoped this confrontation would stir up a rebellion of citizens against what he saw as an unjust legal system. The gang took over the Glenrowan railway station, but Kelly was careful not to damage the telegraph, so the station master could alert the police. 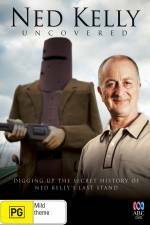 The gang moved the railway staff to the Glenrowan Inn where they also took the guests as hostages. Because many of them were Kelly sympathisers, the night was spent in song and merriment as they waited for police to arrive. Eventually, a local school teacher (who was released by Kelly to check on his family) alerted police to the gang's whereabouts. Police and railway staff surrounded the inn, ready to fire at any of the gang members who left the building. When the rough armour was removed, Ned was found to have some 28 bullets in his body. 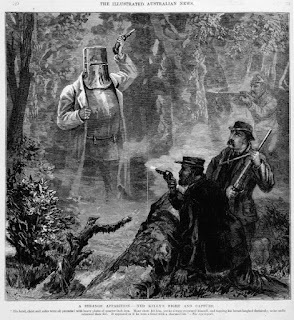 Source: Dowsett, J 1973, 'The capture of Ned Kelly' [manuscript ca. 1880], La Trobe Journal, No. 11 April.